This is my first illustrated book. Inspired by my own daughter's tendencies to wake me up all night every night, I wrote this story and drew the pictures to go with it. Hopefully, it will be the first of many illustrated books. 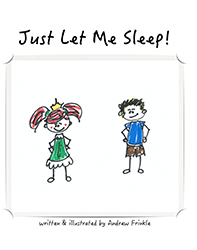 This 8x10 inch full color picture book features hilarious illustrations of Molly-Anne’s little brother Steven attempting anything and EVERYTHING to try to keep her from getting a good night’s sleep. Will he keep her up all night, or will her will to sleep overpower even his best efforts?